For the impatient, click here to download the mapping spreadsheet. For those still reading… Firstly, many thanks to the OWASP community for hosting the fantastic OWASP Summit 2011 in Lisbon, Portugal a few weeks back. This was a fantastic forum for us to hold OpenSAMM working sessions to discuss experiences and potential improvements to the model. Over the course of the week, we were able to build up a list of additions/changes we’d like to make in the next release, but I’ll cover those in more detail under separate cover. The main thing I want to share now is an activity-level mapping of the ~110 BSIMM2 activities to the corresponding 72 activities in SAMM. 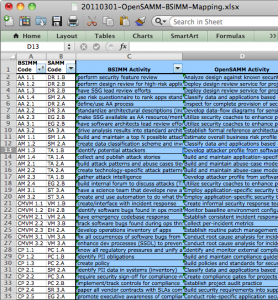 Obviously, this means that in some cases, more than one BSIMM activity may be mapped to a single SAMM activity. That being said, the overlap spots seem to make sense when we (the ~10 people that worked on it) looked at them in detail. Don’t take our word for it, though, please do review and send any feedback (mailing list or just comment below). And before you ask, yes, you probably will have to go read the respective BSIMM and SAMM activity descriptions in order to see the linkage for some of them (given the occasionally imprecise nature of written language, it’s not always obvious from the activity names alone). It’s worth noting that we did leave two BSIMM activities unmapped. They are SM 3.2 “run external marketing program” and T 3.3 “host external software security events”. Based on the experience of the working group participants, these activities did not appear to directly improve an organization’s software assurance posture, rather, they appeared to be evidence that the organization was using its (presumably mature) software assurance posture to bolster its public perception or generate additional value in the business. Again, this is totally up for debate if anyone has an argument the other way, so please do share your thoughts. Security maturity models are the newest thing, and also a very old idea with a new name. If you look back 25 years to the dreaded Orange Book (also known as the Trusted Computer System Evaluation Criteria or TCSEC), it included two types of requirements – functional (i.e., features) and assurance. The way Orange Book specified assurance is through techniques like design documentation, use of configuration management, formal modeling, trusted distribution, independent testing, etc. Each of the requirements stepped up as the system moved from the lowest levels of assurance (D) to the highest (A1). Or in other words, to get a more secure system, you need a more mature security development process. In the past 25 years since the TCSEC, there have been dozens of efforts to define maturity models to emphasize security. Most (probably all!) of them are based on wishful thinking: if only we’d invest more in various processes, we’d get more secure systems. Unfortunately, with very minor exceptions, the recommendations for how to build more secure software are based on “gut feel” and not any metrics. So how do security maturity models like OpenSAMM and BSIMM fit into this picture? Both have done a great job cataloging, updating, and organizing many of the “rules of thumb” that have been used over the past few decades for investing in software assurance. By defining a common language to describe the techniques we use, these models will enable us to compare one organization to another, and will help organizations understand areas where they may be more or less advanced than their peers. However, they still won’t tell us which techniques are the most cost effective methods to gain assurance. Which begs the question – which is the better model? My answer is simple: it doesn’t really matter. Both are good structures for comparing an organization to a benchmark. Neither has metrics to show which techniques are cost effective and which are just things that we hope will have a positive impact. We’re not yet at the point of VHS vs. Betamax or BlueRay vs. HD DVD, and we may never get there. Since these are process standards, not technical standards, moving in the direction of either BSIMM or OpenSAMM will help an organization advance – and waiting for the dust to settle just means it will take longer to catch up with other organizations. Or in short: don’t let the perfect be the enemy of the good. For software assurance, it’s time to get moving now. Jeremy Epstein is Senior Computer Scientist at SRI International where he’s involved in various types of computer security research. Over 20+ years in the security business, Jeremy has done research in multilevel systems and voting equipment, led security product development teams, has been involved in far too many government certifications, and tried his hand at consulting. He’s published dozens of articles in industry magazines and research conferences. Jeremy earned a B.S. from New Mexico Tech and a M.S. from Purdue University. What’s up with the other model? So, a long time ago in a galaxy far… ahem… actually, it was last July (2008). Brian Chess and I had a drink at RSA and discussed what I’d be doing with my time now that I’d left Cigital to start independent consulting. I was really focused on using my new found spare time to build the next revision to CLASP. In my vision (which I talked about as early as the OWASP EU conference in Milan in May of 2007), there would be a model that both demonstrated how to logically improve individual security functions over time as well as a collection of prescriptive roadmaps based on the organization type. Brian and Fortify gave me contract to fund development of what would become the SAMM Beta. Once the Beta was complete last August, Gary McGraw (who sits on Fortify’s Technical Advisory Board) got word of SAMM and wanted to get Cigital involved. We had one meeting for Cigital to provide feedback on SAMM, but it was clear to me that they wanted to take the model in a different direction than I had wanted (lots of reasons here, but one objection I had was use of branding/marketing terminology). So, we forked. Gary, Brian, and Sammy (and maybe others) massaged the high-level framework from SAMM into what they call their Software Security Framework (SSF). They took this out to 9 big companies with advanced secure development practices to get feedback on what those companies are actually doing. Though I really liked the idea of collecting that data, I wasn’t involved at all. Based on what they learned from SAMM and what they heard from those 9, they created the BSI-MM. So, even though the models may seem similar in structure, they’re different in terms of content. Just as a disclaimer on the current state of things, I have not worked with the folks at Cigital, but I’m still actively collaborating with folks at Fortify who are supporting both models (and maybe others too!). If folks are interested, I’ll write up more about SAMM vs. BSI-MM once the next release of SAMM comes out next week.